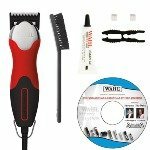 The Wahl 8881 Switchblade Clipper kit includes: Clipper, Competition Series #10 detachable blade, storage case, 2 extra drive tips, removal tool, cleaning brush, blade oil and instructions. The Wahl Switchblade is a Professional Animal clipper kit that was designed with all of the important features in mind such as lightweight, quiet and tough enough for all of your grooming needs! Once upon a time only heavy, loud and hot clippers were available to animal lovers. But times have changed – professionals now have many choices including the lightweight, quiet, and durable Switchblade clipper. If you want to save time and have a great finished clip, whether you need to trim paws or whiskers or complete a full body groom; the Switchblade variable speed clipper is for you! The Wahl Switchblade professional variable speed clipper has the power and torque to clip even the toughest coats. With a no maintenance motor that requires no oil or grease and a patented “easy-to-replace” drive tip there is no need to take apart the clipper. The Switchblade is an advanced professional corded clipper with an innovative linear blade drive system that delivers power, speed, and performance where you need it. Enjoy the ease of clipping with variable speeds up to 4,200 strokes per minute. The curved, lightweight, and ergonomically designed clipper reduces hair clogging and is cool running to extend motor life. It is perfect for clipping face and ears and full body clipping making grooming easier. Cut your clipping time in half with the smoother feeding and faster cutting ability that the new Ultimate Competition Series blades offer. The smoother feeding leaves no clipper tracks and the black chrome finish adds more durability. The new high performance blades cut 2.5 times faster than Wahl Competition Series blades and are 100% quality guaranteed to cut fur the first time they are used. The Ultimate Competition Blades fit the Wahl KM-2, Switchblade, Storm, Storm II, ProFicient and Oster* and Andis** detachable style clippers. The unsurpassed cutting ability of the Ultimate Competition Blades by Wahl ensures top clipper performance for all grooming types. Wahl Professional Animal blades are always made of high grade steel to ensure long lasting durability with a patented manufacturing process that allows tough animal coats to feed and cut quickly and efficiently. The innovative blade process allows the Ultimate Competition Series blades to cut faster and last longer for heavy duty clipping all day long. The Wahl Ultimate Competition blades are designed and manufactured in the USA of imported and domestic parts. At Wahl we understand that there are several types of clipper motor styles to purchase and that sometimes you may desire to try a different clipper. With this in mind all Wahl products have a full no questions asked 30-day satisfaction guarantee. 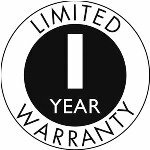 If for any reason your clipper does not work to your complete satisfaction simply call 1-800-PRO-WAHL for an exchange to a clipper that fits your needs or for a full refund. Please have your sales receipt available when contacting Wahl. The use of OSTER and ANDIS or other product names or trademarks is for informational and comparison purposes only; there is no association between Wahl and these companies or their products. *OSTER is a registered trademark of Sunbeam Products, Inc. **ANDIS is a registered trademark of Andis Company. Wahl Switchblade Clippers I really like the design and function of these clippers. They are easy to hold and cut super fast without hair getting caught. Wahl Swichblade Clippers I really like the fact that the clippers are super quiet and you can adjust the speed. The clippers cut clean and do a good job. The reason I am only giving these clippers a three star is that the get hot very fast. You then have to turn off the clippers and let them cool down. Also, with the placing where the speed dial is, it is easy for your hand to turn it up or down as you are grooming.